Tikka masala is one of my favorite Indian dishes to order: that sauce, oh that sauce...rich, creamy, tangy, sweet, spicy. My "meat" of choice is usually tofu, which sops up the sauce in such an amazing and satisfying way. This recipe, however, takes a bit of a detour from the usual by using tempeh. For me, the jury is still out on this fermented soybean cake. Sometimes I like it (like, not love), and sometimes I hate it. But in this recipe, it still left me undecided. The fact that this recipe has so many parts and needs to be made a day in advance also doesn't quite help. Let's start with the sauce. It's pretty simple: add onions, fresh ginger, garlic, buttermilk, tandoori spice mix, lime juice, and a bit of salt to a food processor, and puree. The recipe says "until smooth," but I don't think it's possible to get it 100% smooth; a slurry-like consistency is what I ended up with, which was fine. But the aroma of it is absolutely amazing. The ginger and onions are so powerful, your eyes almost begin to water from just a sniff. I suppose depending on the brand of tandoori spice mix that you use will determine its heat level, but mine was SPICY. HOT. FIRE. Anyway, the tempeh is marinated overnight in this mixture. Next, make the raita. Grated cucumber, chopped mint, and cumin are added to buttermilk, then chilled overnight. I should have known there was a problem with the grated cucumber (or the recipe instructions, perhaps): so much water seeped out of the cuke, to the point that it made the raita extremely watery. I'd definitely suggest draining the grated cuke on paper towels to get as much water out as possible. 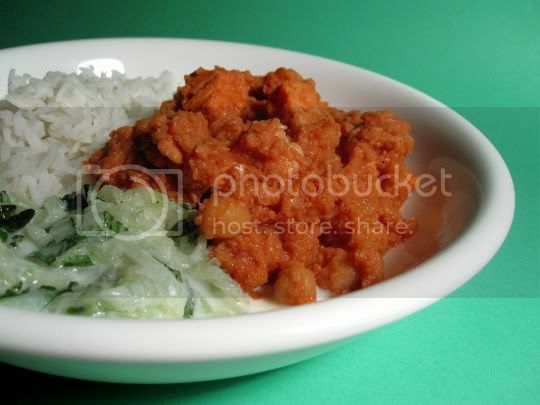 The next day, you'll add tomato puree, honey, chickpeas, and cauliflower florets to the tempeh mixture, and then bake. The recipe suggests 40 minutes to achieve a nice deep red color, but I found that took more like an hour. So what's the end result? A yummy, ultra flavorful, hearty, aromatic, seemingly authentic Indian dish. The heat from the sauce mellowed a bit, which was good. The sauce was rich and thick, sweet and spicy, very gingery with a heavy tomato flavor, and almost had some fruity elements. The tempeh STILL had that weird sour flavor (even after marinating a full 24 hours! ), but the cauliflower and chickpeas were saucy and amazing. The raita served alongside the masala was a cool and refreshing complement, but it was still wayyyyy too watery to really enjoy. I thought maybe the overnight chill would firm it up a bit, but no. This ended up being more like buttermilk-soaked, minty cucumbers, and not creamy and thick like a raita should be. Leftovers were good, but I think it's better served immediately (gotta get that intoxicating sauce aroma!). Make again? The raita: NO, HELL NO. But the tikka masala? Definitely, although I'd use tofu or seitan in place of the tempeh. That would surely give this recipe review 5 hearts! Vegan variation: Use a vegan variation of buttermilk, and substitute the honey with another liquid sweetener, maybe agave nectar (if desired).